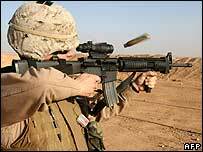 May has been one of the deadliest months on record in Iraq - 10 American soldiers were killed on Memorial Day alone bringing US deaths to a total of 120, the highest since November 2004. And in one day five Britons were also kidnapped, 44 people died in vehicle bombs in Baghdad and the bodies of 32 men who had been shot and tortured were found in two locations around the capital. 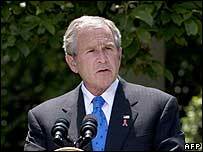 President Bush had warned of the risks of his military build-up or so-called "surge" in a news conference last week. "We're going to expect heavy fighting in the weeks and months ahead. We can expect more American and Iraqi casualties," he said. But the president must report on the progress of his strategy under the new Iraq War Funding Bill no later than 15 July. And some major policy groups are already doubtful that it can succeed. The Brookings Institution, a Washington based think-tank, says two major problems stand out. The first is the continued resilience of al-Qaeda and the extensive use of vehicle bombs. 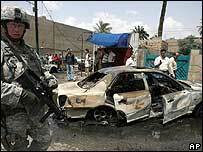 They are the biggest reason why overall fatality rates in Iraq have not declined. The second is the lack of political compromise in Iraq. One of the key benchmarks in the Funding Bill is a hydrocarbon law that would ensure the fair distribution of oil revenues - but little progress has been made on this and other areas of reconciliation. "On balance, the picture in Iraq has some signs of hope, but continues to present more grounds for worry than for confidence," says a Brookings Institution report on the situation in May. "Unless things improve steadily and substantially in the coming months, it will be hard to believe that the new surge based strategy can succeed." However, Army Brig Gen Steven Anderson, deputy chief of staff for resources and sustainment, is optimistic about the future. "There are some signs that our new strategy is working," he said during a speech to the James Madison University. "There is plenty of opportunity, and plenty of reason to be cautiously optimistic about what's going on over there." He points to economic progress and retention rates among deployed troops as signs of progress and encouragement. The Brookings Institution also reports on some encouraging signs since the surge of troops. It says that extrajudicial killings are substantially down and much of the civil conflict that characterised Iraq in 2006 has been suppressed. But if Mr Bush cannot report progress in key areas which range from amending the Iraqi constitution to reducing sectarian violence, Congress can vote to withhold economic aid to Iraq. The president can waive that decision, but if the benchmarks are not being met and the bloodshed continues he will certainly come under renewed attacks from his growing anti-war and political opponents. The Iraq War Funding Bill itself has been widely criticised for failing to set a timetable for troop withdrawals or for setting out consequences if the benchmarks are not met. But Anthony Cordesman of the Center for Strategic Studies warns that eventual success in critical areas is more important than meeting deadlines. "There are no artificial deadlines," he says. "But both the president and the Iraqi government are put under considerable pressure to make real progress by the reporting requirements and potential cut-off of Economic Support Fund aid." In September, America's top commander in Iraq, Army Gen David Petraeus is due to report to Congress. His assessment will likely provide the backdrop to the next round of war spending.